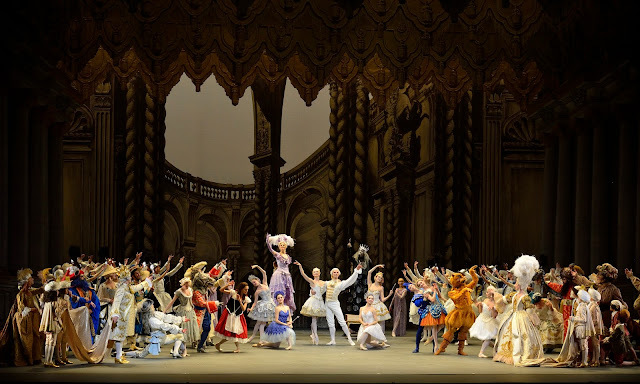 ABT recently had its New York premiere run of Alexei Ratmansky's grand, ambitious new production of The Sleeping Beauty at the Met Opera House. As traditional as it is—with powdered wigs, knee-length tulip tutus, and pantaloons—the most radical element, other than anarchist knitters, is the choreography, which evokes royal court dance of centuries past rather than the full-out athletic style to which we've become so accustomed. Ratmansky drew from Petipa's choreography as recorded in Stepanov notation for an authenticity so outmoded as to appear radical. William Christie and Les Arts Florissants have brought new audiences to early music, but such a rediscovery has been rare in ballet. Part of the radicalism is that the steps don't always default to a dancer's maximum range, as is often the norm. (As stunning as the Mariinsky and Bolshoi can be, freakish flexibility is now standard.) The women wear pointe shoes (even the girls wear them in the garland dance) but when they chainé, it's nearly always on demi-pointe. Many of the preparatory and closing positions of moves feature broken lines and coyly angled arms and heads; pirouettes are executed with the foot poised near the ankle. The biggest partnered lifts feature Aurora's legs forming a taut diamond shape, or a series of compact fish dives. I imagine that the dancers had to fight everything reflexive and had to re-learn Ratmansky's particular syntax by rote repetition. No six o'clock developpés or mindless strings of filler steps here. The lavish costumes and sets (by Richard Hudson, inspired by Léon Bakst) set a royal tone. Elaborate hats, headpieces, and wigs—to my eye, distracting at times—reinforce the idea that no expense was spared in this co-production with Teatro alla Scala in Milan. Only the artificially garish hue of the Lilac Fairy's satin dress and gown hints at the 21st-century origination. Gillian Murphy (Aurora) and James Whiteside (Désiré) led one performance I caught, with Stella Abrera as the Lilac Fairy. This is a forceful cast with more edges than softness. Murphy is so competent that it would indeed take some kind of toxin or witchcraft to keep her down. Craig Salstein was Carabosse, swathed in pewter lamé and matching makeup, and squired by huge rats. In the June 13 evening performance, the more finely burnished pair of Diana Vishneva and Marcelo Gomes danced the leads. They are becoming our era's superstar duo if they aren't already. Gomes manages to make Désiré more impetuous and thoughtful than impatient. Vishneva opted to do some chainés on pointe, whereas Murphy consistently performed chainés on demi-pointe. (Piqué turns were performed on pointe throughout.) Principal Veronika Part, rarely seen this season, danced the Lilac Fairy with graciousness, and Nancy Raffa, a company ballet master, Carabosse; interestingly, both men and women past and present are cast in this juicy character role. The legend has been fleshed out to include commonly excluded elements. The Act I fairies include not only characteristics, but allegories: Wheat Flower and Breadcrumb, presumably representing abundance and resourcefulness. In Act III, gemstone fairies make appearances at the wedding, in addition to the fairy tale characters such as Princess Florine and Bluebird (with a proper pas de deux), an ogre couple and a gang of boys, and Cinderella and her prince. (Others don't even dance.) It's an exercise in traffic control, as is the Garland Dance; one can only imagine what it must be like backstage. But the all-hands-on-deck casting, which allows casting principals in supporting roles, also provides a substantial opportunity to gauge the talent and resources of this major company. 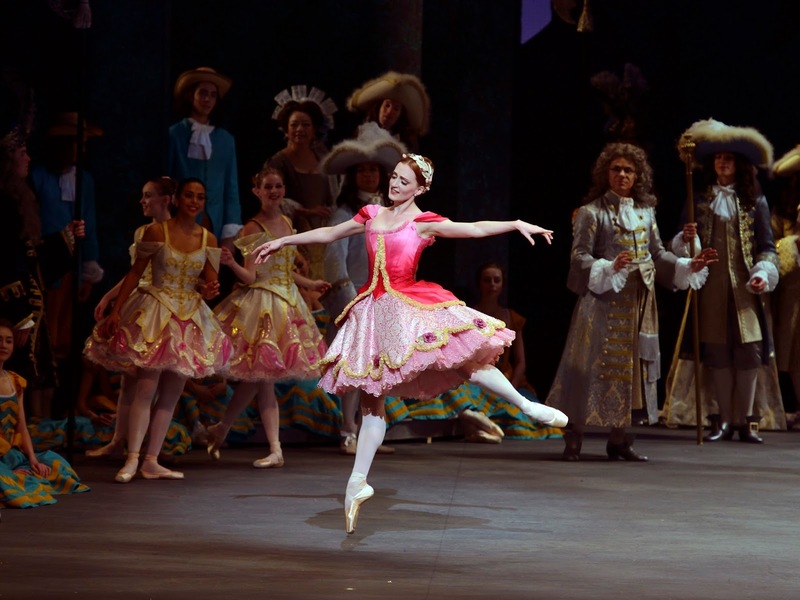 That this is the second Sleeping Beauty production in the span of eight years not only acknowledges the shortcomings of the last production, it also speaks to the strength of the company's development department, and is a confident bet on Ratmansky by the executives. For my taste, The Sleeping Beauty is one of the more trying traditional romantic story ballets still regularly staged. It's thin on overall plot, thick on allegory and bodies, and demands a great deal of patience not required of viewers by most contemporary ballet productions. (Short attention span?) While some musical themes by Tchaikovsky are lovely and evocative, many of the variations end abruptly, necessitating the steps to also end bluntly. And yet there is the accompanying textural richness and depth of tradition. It is in fact disorienting to see the archaic form when we're so accustomed to seeing the hyperextension of every line. But it gives this production a unique, genteel style that looks forward by looking to the past. Interestingly, over the course of the run's last week, the style rebounded somewhat away from the archaic and shifted toward the modern, or the second time around, it wasn't so shocking to my eye. (It could also have been Vishneva's reluctance to fully embrace the archaic style.) What will it look like next year or in five years? No doubt we'll find out.